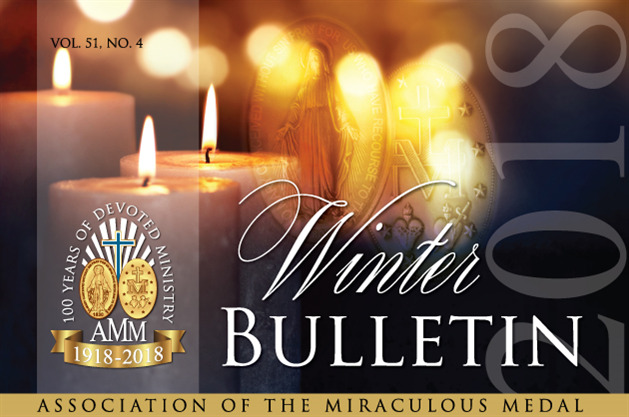 In the 2018 Winter Bulletin, Father Kevin concludes his series reflecting on the closing address given by Pope Francis in 2017 at the Vincentian Family Symposium. All of us are asked to go out and make disciples of all nations. Don writes about unanswered prayers with the lingering question of “why” and Fr. Tom Hinni invites us to live in the joy that only Jesus gives, while Fr. Charles Shelby talks about “the best boss in the world.” You will also read about the Association’s 100th anniversary celebration that took place in October. A new Votive Light card is available to use during the bleak winter months. Spots are still available on our 2019 pilgrimages to France and Lourdes, and the river cruise in December. To see how you help us do our Lady’s work, a financial accountability report for 2018 is included. To learn more about the ways you can give a Year-End gift to the Association, be sure to read the Winter Bulletin.